Christmas is here. We are overloaded with goodies, enjoying the perfect Arizona "winter", and loving the excitement our little man has for "Chissmas tine" (as he says it!) This week's Tuesdays with Dorie recipe sounded delicious, especially since I tried pecan pie for the first time last week and loved it (you can find the original recipe at Beth's blog). That's right, I'd never tried it before. 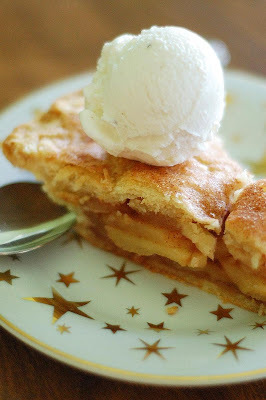 Sometime I decided I didn't like it and so I've never eaten it, heading instead for the apple or berry pies. But Pecan Pie has been redeemed for my palate, not unlike guacamole which was a smash hit when I finally tried it when I was about 18. 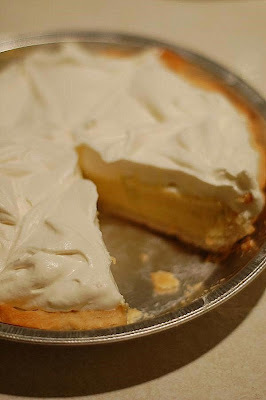 With all the Christmas craziness, though, I didn't have time to make a pie crust. So I rolled out a piece of puff pastry, trimmed the edges, glued the strips on to make a little wall, and crisped it in the oven for a few. Meanwhile, I prepped half the filling, added a little flour, and cooked it until it boiled on the stove. Then I stirred in the egg and vanilla, poured the sauce into the shell, and sprinkled it with nuts. The good news is that the whole thing only takes a few minutes to make, even with two crazy kids in the kitchen. ANYONE can make this, really! 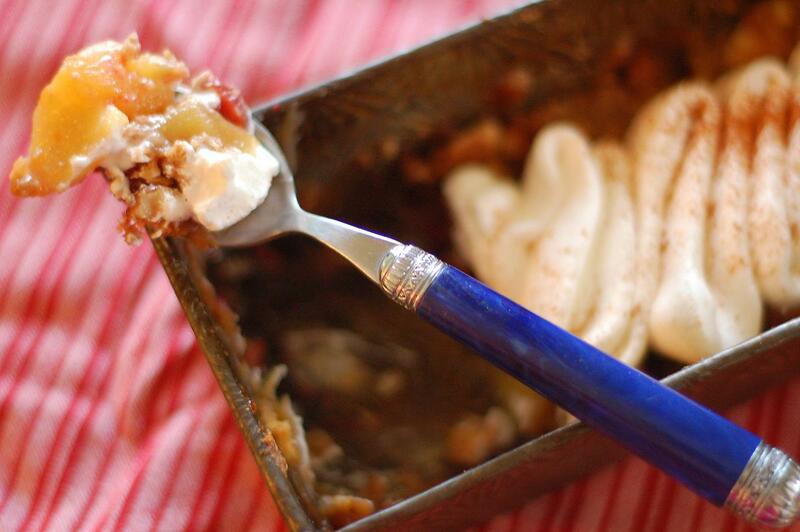 And while this isn't exactly a traditional pecan pie, you can't really go wrong with butter, nuts, and brown sugar. Then go ahead and top it with whipped cream. Like Ina would say, "How bad can that be?" And while I'm glad to know I actually love pecan pie, I guess my "skinny jeans goals" should just be grateful it took me a while to figure that out! 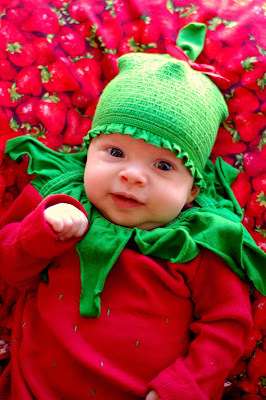 PS This is indeed my 200th post (so you get a picture of my little man and baby strawberry!). 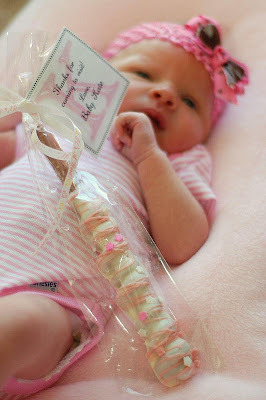 I guess the picture is pretty fitting since she's the most delicious thing I've made since I started this blog. 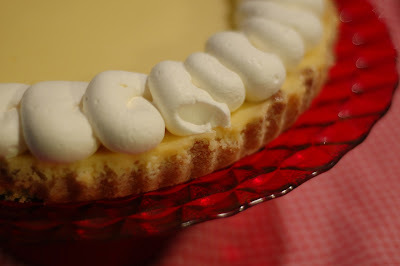 You can click here to see some of my favorite recipes so far- and admist many buttery, delicious treats there are even a few salads (promise!). Thanks for reading along and have a very Merry Christmas! Flour a board and roll out the puff pastry to about 11 by 11. Trim a 1 inch strip off each side. Place large sheet on a lined baking sheet. Whip one egg with 1 teaspoon of water. Using a pastry brush, apply the egg wash to the borders of the puff pastry and gently place the strips on top to adhere them (forming a frame). Dock the center of the pastry with a fork, using the tines to prick all over the dough every 1/4 inch or so. Brush the top of the edges with the egg wash to promote browning. Place in the oven and bake for 10 minutes. 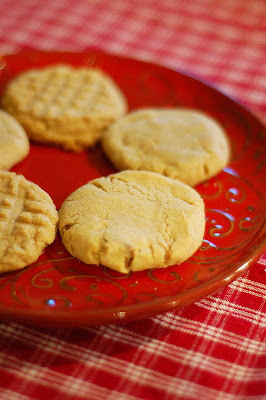 In a medium saucepan, combine the syrup, brown sugar, butter, flour, and salt. Whisk over medium heat until the mixture boils then set aside for a few minutes. Then, while whisking, slowly pour in the egg wash and the other egg. Whisk in the vanilla until everything is thoroughly combined. Carefully spoon sauce over the pastry shell, filling the created cavity. 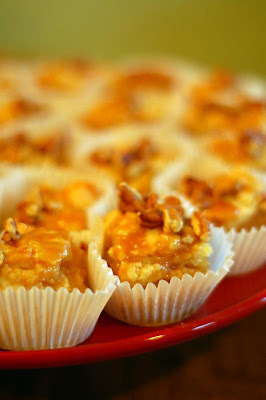 Sprinkle with nuts and bake for 10 more minutes, or until the pastry is browned and the filling it set. Cut and serve with whipped cream or ice cream. Slacker, slacker, slacker. Between working on getting the laundry folded before it's time to wash again and Christmas fun, I've pretty much totally neglected my blog. I do have fun news though. 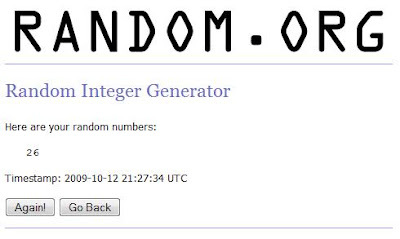 First, I have a winner for my Lemon Tart Giveaway- it's Megan! Thank you so much to the author, Josi Kilpack, for donating the book and for everyone's great reading suggestions. Hopefully my Baby Strawberry and Little Man will be on the same nap schedule soon and I'll start reading things besides cookbooks and emails again, haha. I also received a nice but very frustrated email from someone who wants my recipes to be printable. 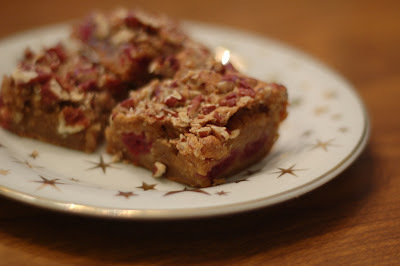 So, in honor of my 200th post coming up next (and yet to be planned, ahem) I'm going to try to start including a printable recipe with the posts, following Aggie's wonderful instructions. Don't tell my husband I'll be taking one extra step, he already thinks I spend too much time as Anne Strawberry, instead of Anne Wife (but I think the roles go together, right?)! 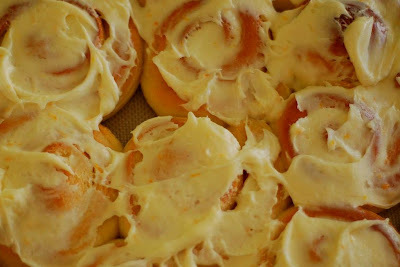 Maybe sometime I'll go back and add links in (which I did with my Orange Rolls). Let me know how they work out for you guys. I do love the feedback people give, especially when a recipe worked out for them. Pre-heat oven to 350°F. Grease and flour small rectangular baking dish (line the pan with foil for easy removal and cutting later. 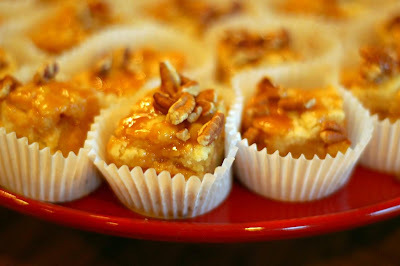 If you want these gooier use a small square pan, but next time I'll keep them a little thinner for even baking). Combine flour, sugar, baking powder, salt, oil, eggs and vanilla; mix on low speed of electric mixer until blended. Mix 1 minute on medium speed. Batter will be thick. Spread half of batter in pan. Toss raspberries in small amount of flour. Scatter berries over batter; spread remaining batter on top (gently!). Sprinkle with pecans. Bake 30 to 35 minutes or until tester comes out clean. Cool on rack and cut into 16 pieces. Chocolate Chip Variation: Sprinkle ½ cup chocolate chips over batter with pecans. I've always loved those butter cookies in the blue tin that you find around Christmas. 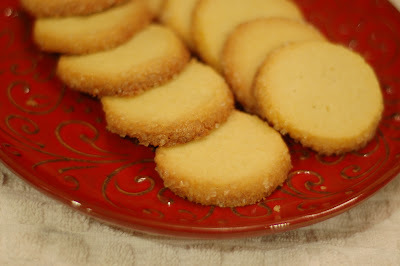 I haven't, however, had much luck with shortbread in my hot kitchen. So when I read this recipe, I decided to go for it but wasn't expecting much. That said, I was so WOWED by these cookies! 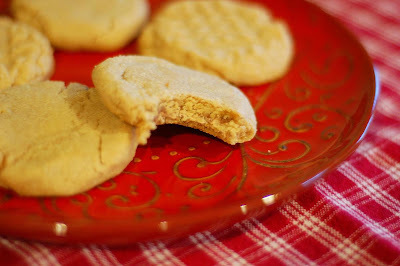 They were quick, easy, Christmas-y, delicious, buttery... pretty much everything you want in a holiday cookie. I made the original version but can't wait to try the orange and lemon flavors. And then the pecan version for my mom. Use a light hand and don't over think these- Dorie's directions are clear and simple and will get you a great result from a few simple, delicious ingredients. I love that. This is one that will be on regular repeat in my kitchen (and since I know you'll love it and NYT already printed it, I'm including the recipe). 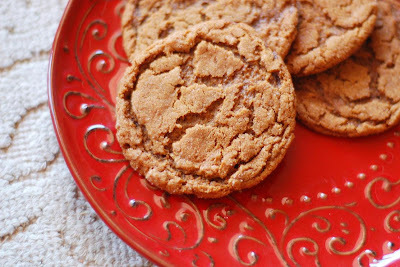 This is the best slice and bake cookie I've ever made and I'm making them again soon. Thanks to Bungalow Barbara for an amazing choice- just in time for Christmas cookies. I probably never would have made this if not for TWD and I'm glad I did. 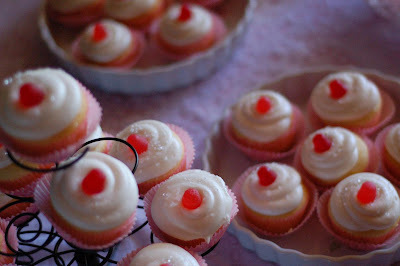 My only regret is that I gave the rest away and now I will be looking at pictures of these all day without any to try! 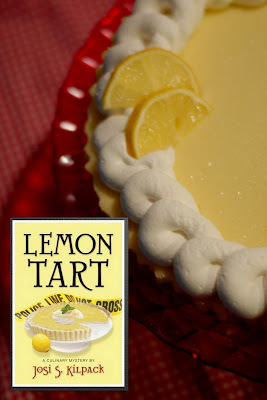 Don't forget to enter my special Lemon Tart Giveaway! Working in a mixer fitted with a paddle attachment, beat the butter at medium speed until it is smooth and very creamy. Add the sugars and salt and continue to beat until smooth and velvety, not fluffy and airy, about 1 minute. Reduce the mixer speed to low and beat in 2 egg yolks, again beating until well blended. Scrape the dough onto a work surface, gather it into a ball and divide it in half. Shape each piece into a smooth log about 9 inches long (it's easiest to work on a piece of plastic wrap and use the plastic to help form the log). Wrap the logs well and chill them for at least 2 hours. The dough may be kept in the refrigerator for up to 3 days or frozen for up to 2 months. When ready to bake, center a rack in the oven and preheat the oven to 350 degrees. 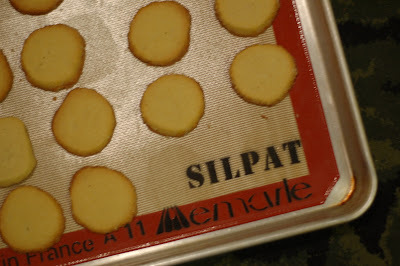 Line a baking sheet with a silicone baking mat or parchment paper and keep it at the ready. To decorate the edges of the sables, whisk the egg yolk until smooth. Place one log of chilled dough on a piece of waxed paper and brush it with yolk (the glue), and then sprinkle the entire surface of the log with sugar. Trim the ends of the roll if they are ragged and slice the log into 1/3-inch-thick cookies. Lemon Sables- Before mixing the butter and sugar together, pour the sugar in a bowl with the grated zest of 1 to 1 1/2 lemons. Work the zest and sugar together with your fingertips until the mixture is moist and aromatic, then cream it with the butter in the mixer. Parmesan Sables- Replace sugars with 3/4 cup very finely grated Parmesan added to the beaten butter. A few grains of fleur de sel may be gently pressed into the top of each sable before the baking sheet is slipped into the oven. And some pecans for kicks. And because they are good for you, right? There are a lot of layers to these bad boys and you can make it how you like it- homemade, store bought, add nuts, whatever you'd like. I'd just encourage you to try it because the finished product is yummy and perfect for fall. I cut mine into little pieces and the portion size was just right. And with all those yummy layers, my husband didn't even miss some chocolate. That's a good dessert around here! Have a happy Halloween and I'll be back soon with a picture of the kiddos in their costumes. Wait until you see what my mom made for my baby girl... she's going to be delicious! Preheat oven to 350 degrees F. Pulse cereal in a food processor until smooth then pour in melted butter while pulsing to combine. Press into an 8×8 inch baking dish lined with foil. Bake for 7 minutes then remove from oven. Let cool for 5 minutes. Crumble half of the cookie dough over partially baked crust. Place cream cheese, sugar and vanilla into a mixer; beat until smooth. Pour over crumbled cookie dough layer. Top with the apple pie filling. Carefully spoon over remaining cookie dough, breaking off into little pieces evenly over top. Bake for 45-50 minutes or until toothpick comes clean from center. Let cool completely then cut into squares (I cut it into a 5 by 5). Melt caramels and half and half according to package directions. Drizzle over each bar. Refrigerate leftovers. Cream together butter and sugar until light and fluffy. Add eggs and vanilla and beat thoroughly. 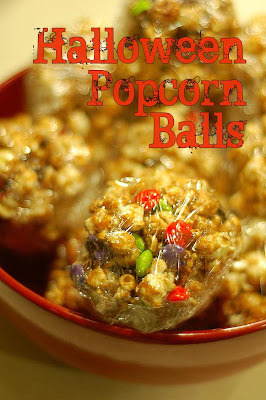 Add in dry ingredients slowly mix until just combined, being careful not to overmix. 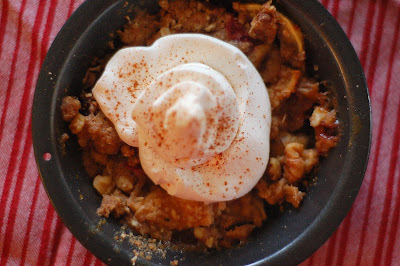 Note- I reduced this and just used four or five apples that I had on hand, but any of this leftover certainly tastes good enough to out of the bowl or with some ice cream! Peel, core, and slice apples into medium, microwave proof bowl. Cover with plastic wrap and microwave on high for five minutes. Let cool slightly then stir in other ingredients and mash with potato masher until desired consistency is reached. I read that today is world pasta day and since I'd eat pasta everyday for the rest of my life if my husband didn't mind, I figured a quick recipe was in order. 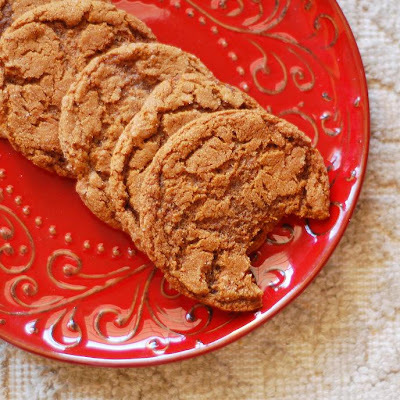 This recipe from Giada is customizable and delicious. I was led to it initially because it wasn't smothered in tomato sauce that my tall man couldn't eat. I plated the lasagna rolls on a bed of marinara for everyone else- and I think that really made the dish- but you could leave it out if your husband is like mine! This is a fun variation from the regular sausage and tomato lasagna we normally eat- the prosciutto and spinach are flavorful and delicious... even to my two year old. Happy World Pasta Day! Butter a 13-by-9-by-2-inch glass baking dish. Pour the bechamel sauce over the bottom of the prepared dish. Lay out 4 lasagna noodles on a work surface, then spread about 3 tablespoons of ricotta mixture evenly over each noodle. Starting at 1 end, roll each noodle like a jelly roll. Lay the lasagna rolls seam side down, without touching, atop the béchamel sauce in the dish. Repeat with the remaining noodles and ricotta mixture. Spoon 1 cup of marinara sauce over the lasagna rolls. Sprinkle the mozzarella and remaining 2 tablespoons of Parmesan over the lasagna rolls. Cover tightly with foil. Bake until heated through and the sauce bubbles, about 20 minutes. 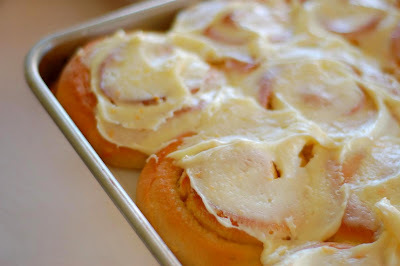 My Tall Man loves Cinnamon Rolls (well, he loves any white bread and nearly all carbohydrates, but he especially loves Cinnamon Rolls) so I decided to make them for his birthday treat again this year (that was a few weeks ago- before the baby- don't worry, I'm not wrestling with yeast and a newborn yet!). View the complete recipe here (page 143). I've posted a quick version for my own records here, since I'll be making these regularly and can never seem to keep track of the paper copies! NOTE- Do NOT double this recipe in your KitchenAid. The second time I made these I did that and I ended up kneading the dough by hand, worrying I'd nearly killed my beloved Empire Red, and generally just regretting my decision. 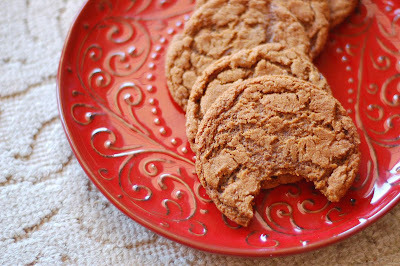 It only takes a few minutes to whip these up in your mixer so just be patient and do so in two batches- trust me! Let me know if you've made this recipe before and if you have any recommendations on whole wheat flour, different flavors (I'm trying orange rolls next time), or general tips. I'm far from a bread expert which is why I loved this recipe- he really walks you through it in the book and even with little experience these turn out great. Cream together sugar, salt, and shortening on medium high speed in mixer with paddle attachment. Whip in the egg and lemon zest until smooth. Then add the flour, yeast, and milk. Mix on low speed until the dough forms a ball. Switch to the dough hook and mix for about 10 minutes on medium, or until the dough is silky and supple, tacky but not sticky. Add a little flour or water if necessary to attain this texture. 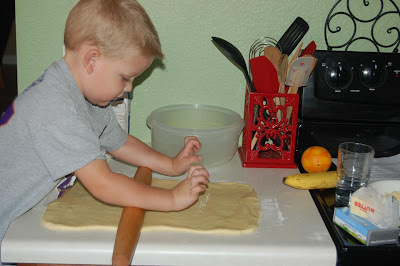 Lightly flour or oil a counter and roll the dough into a rectangle about 2/3 inch thick, or 18 by 9 inches wide. Sprinkle the cinnamon sugar over the dough and roll it up into a log, with the seam down. Slice the log, making the pieces about an inch thick. Place on a parchment or silpat lined baking sheet and let rise until nearly doubled (about an hour in my lovely desert home). 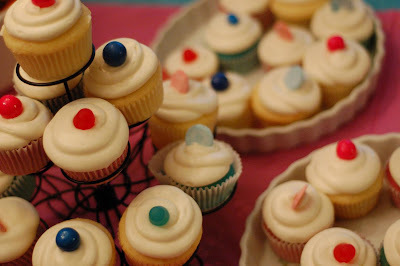 Note- Since I made these for my Tall Man's birthday, I made a plain powdered sugar icing (as shown in the photo) since he's a crazy person and doesn't really like cream cheese. 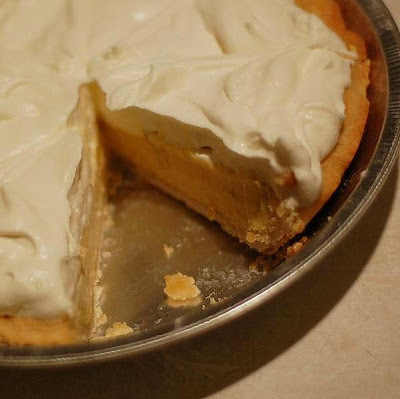 However, they taste even better with a good cream cheese icing, and since I've never met another person, besides my love, that doesn't like cream cheese icing, this is a sure bet. Cream the cream cheese and butter until smooth and well combined. Beat in the vanilla then, with the mixer off, add the powdered sugar. Cover with a clean dish towel and combine on low speed until the sugar is incorporated. Remove towel and increase speed to make a smooth frosting, adding milk until desired consistency is reached. 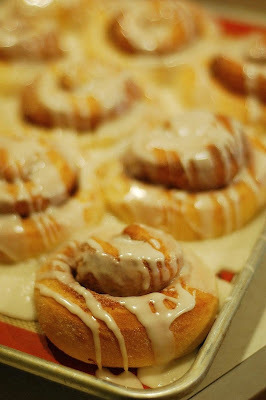 Spread on slightly cooled cinnamon rolls and enjoy! I use Peter's Caramel which you can order online. It comes in a 5 pound box and lasts a very long time, staying soft and delicious. It's about $4 or 5 a pound and a little goes a long way. I think the taste and ease of use is worth it, but you could certainly substitute Kraft caramels. This time I used both white and milk chocolate so people have a choice. The flavor really comes out so I would use Ghiradelli or something else delicious, since you'll really notice it. For the pink drizzle, I melted white chocolate with a couple of red Wilton candy melts (find those at Michael's or any craft store in the candy making aisle) to attain the pink color. I poured the mixture into a squeeze bottle and stored that in a glass of hot water so it maintained it's temperature while I made all the pretzels. Make a double boiler by placing a glass bowl over a saucepan filled with an inch or so of water. Place over medium low heat, watching to make sure the water doesn't touch the glass or condensate into the bowl. Pour in the chocolate, add the Crisco, and stir occasionally until smooth and combined. Reduce heat to low. Meanwhile, cut the caramel into about one inch cubes. Using your hands, roll each piece into a "snake" like you used to do with play doh. When your caramel is about eight inches long, press the end onto the top of the pretzel and wrap it around the rod, forming a spiral. Leave enough pretzel exposed to dip it later. Set all the wrapped pretzels onto a parchment or Silpat lined cooling rack. Once the pretzels are all covered, dip into the chocolate, being careful to cover all of the caramel and drip off the excess chocolate. Lay the rod back on the baking sheet and proceed with the rest, working with about 10 at a time. Drizzle with a contrasting color of melted chocolate, if desired, then add sprinkles. Working with a few at a time ensures the chocolate isn't set before you do the decorating. After they are dipped, place the cooling rack in the fridge to set. When pretzels are set, place in cellophane bags and tie. These keep well for a few days but will last longer than your self control in the freezer. I've been woefully neglecting my blog and I feel the need to apologize. Along the same lines, I should apologize to my husband whose delicious food consumption mirrors my blogs content most of the time (sans chocolate) and who is probably hungry as I type this. Nonetheless, I think the fact that I have NINE DAYS to go until my baby comes is a decent excuse. 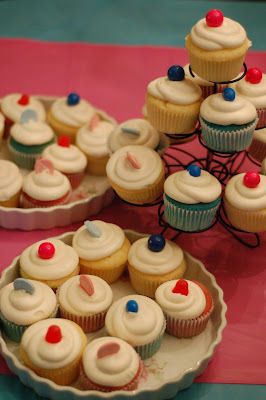 So in case you're sick of looking at panzanella, I thought I'd post some baby shower cupcakes. A friend of mine is having twins so I made pink and blue cupcakes per her request. I'm a little squeamish about blue dyed food but they turned out cute (although the gel dye did a little number on the texture, I think other people didn't notice). I frosted them with my big 16 inch bag and enormous bullet tip then topped them with gumballs, dots, neccos, mm's, and any other bright pink and blue candies I could find. They turned out really cute even if some of them were an unnatural color. 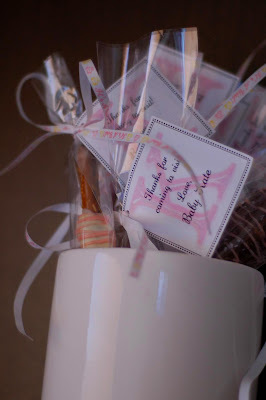 Then I had my baby shower the same day so I made a batch for my own, which is dorky and probably almost offended my aunt, but I told her making one more batch when you are already making two is less than half the work, so she might as well save her self the trouble. I hope that flawed math/logic went over well. Either way, I couldn't resist since my mom found cupcake liners that match the quilt she's making the baby (pink polka dot) so we just had to do it. 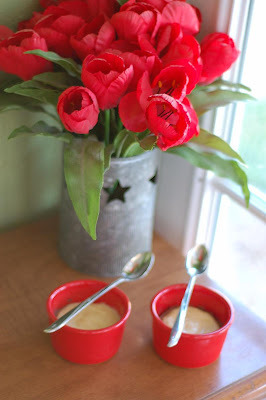 I'm going to repost my frosting recipe since it's one of the most asked for by my "real life" friends (the rest of you, I've dubbed my "cooking friends", which my husband thinks is silly since we've never met and don't talk on the phone or anything, oh well). And while I'm going to try to feed my husband better this week before it's too late and she's here, I make no guarantees. 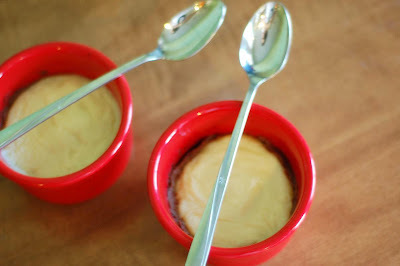 So, to satisfy my "cooking friends" and "real life friends" who stop by my blog to laugh at the large quantity of desserts I make and the gourmet leftovers my husband enjoys at work (when he isn't getting a ham sandwich every day), I'm going to post this one last guaranteed recipe before the baby is born. And I'm going to tell you her name. I think we've finally decided. So the results are.... KATE! While Kate didn't technically win, these two comments echo my sentiments on this subject I've debated with every friend, family member, or perfect stranger sporting a Kate/Katie/Katherine/Kathleen/etc Nametag. And it's funny that it seems so simple that I'd name her Nick if she was actually a he. I guess it's just easier to pick when the choice doesn't matter much! "I prefer Kate. I know a lot of people are citing versatility as a reason to go with Katherine, but as Kate she can still call herself Kat, Katie, and everything short for Katherine if she chose. Naming her Katherine just in case she wants to go by that as an adult seems like a bad reason when you prefer Kate anyway." "I love traditional names too and like both Katherine and Kate, but I don't like Kathy as much as Kate. So my vote is if you want her to be called Kate just name her that :) If it is a boy though, I vote for naming him Nicholas and not just Nick." So there you have it. 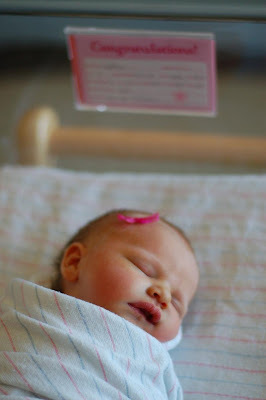 I'm officially declaring her Kate and will probably refer to her as baby girl from her on out, since I hold onto some false notion of blog privacy and refer to my son as "little man" or "baby boy" like his name is some big secret. I know you're all dying to know, too, since it's about as creative/interesting as Kate, and I love it. I hope she never regrets losing the Katherine option, but I guess I never whined to my mom that my name was just Anne! Wish me luck with these last nine days as I'm practically counting the hours. And say a prayer that "Kate" is actually a "Kate" and not a "Nick" because I'll be heartbroken if I have to pack up all those beautiful baby girl clothes, blankets, and bows from the baby shower! 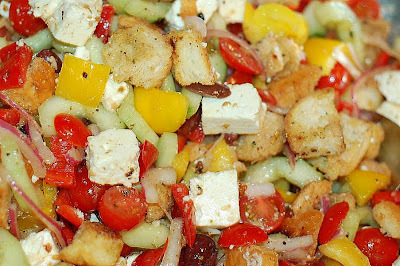 The first time I made Panzanella, I thought, "Where has this been all my life?" My mom tried it and said, "This is like all the best parts of the salad without any of the boring lettuce!" While lettuce has it's place, I'll admit I'm still extra fond of panzanella. So when I watched Ina make a Greek version, it took all self control to refrain from running to the store and making it right then, in the middle of nap time. 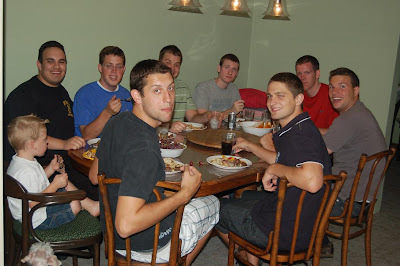 I held off until Monday so we could put in our Greek dinner for my brother's birthday. 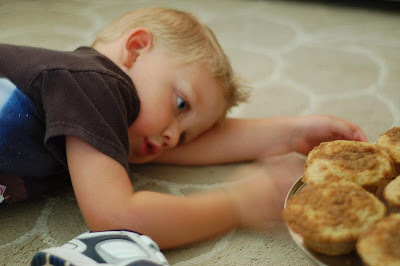 It was simple and delicious and even all those boys gobbled it down. I made a huge recipe and there wasn't a piece left over. With peppers and tomatoes on sale all over right now, I'm sure I'll be making it again soon. *Use two plastic lids (from deli or tupperware containers) to cut the cherry tomatoes- just fill one to the rim with tomatoes, invert the second lid and set on top of the other, and use a serrated knife to saw through them while applying a little pressure on top. Takes all of 30 seconds to cut a whole pint. *Good feta is vital! Yes feta has a unique taste, but it shouldn't taste rotten (like the cheap kind usually does to me). Try Trader Joe's for a Greek made feta stored in brine. It tastes like the real deal. *Watch the bread closely. Don't go check your email while it's toasting. It's a good thing I'd bought two loaves since I had to completely start over and didn't quite get the burnt smell out before the party... oops!